Pink Mexico (Record Release), Darkwing, Lost Boy ? PRS formed in 2014 in what Hay thought would be one-off project for the group to perform for the event Art Rocks Athens. Since then, PRS has turned into a tight touring unit having performed at festivals and venues on both coasts, the Midwest and the Southeast. In addition to Hay, PRS is rounded out by Jason NeSmith (Casper & The Cookies) on guitar, Kay Stanton (Casper & The Cookies) on bass guitar and backing vocals, Damon Denton (Big Atomic) on keyboards, and Joe Rowe (The Glands) on drums. PRS released a 6-song EP, "Part Time Punks Session" in the fall of 2017 on Henry Owings’ Chunklet Industries to rave reviews. 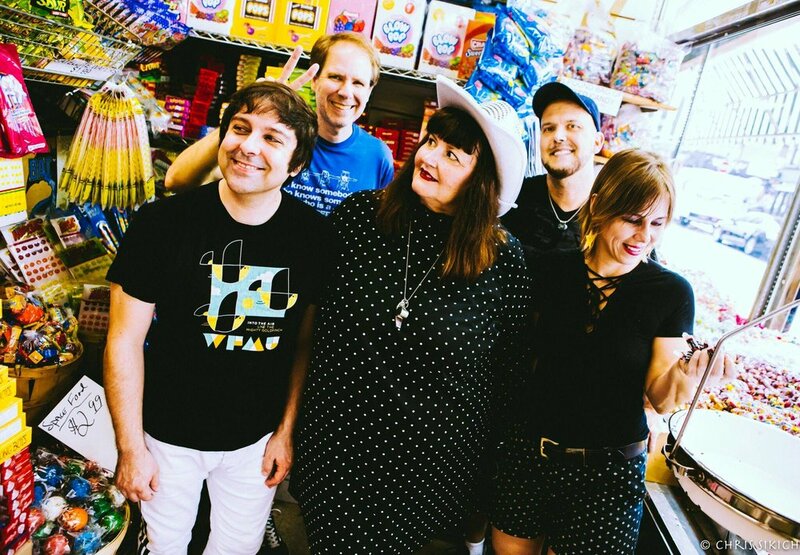 Pylon Reenactment Society is touring in support of the release a 7” vinyl single of two new original songs, “Messenger” and “Cliff Notes”, on Friday, November 30th on Chunklet Industries. “Messenger” is a mid tempo meditation on love, war and modern communication. “Cliff Notes” jumps right in at breakneck speed. The lyrics mix silly dance moves with anti-racist admonitions for the precipice we find ourselves on today. The video for “Messenger” premiered on November 9th on The Bitter Southerner. The video was directed and edited by Tony Brazier, who is currently working on “Athens, GA…30 Years On.” The video captures the playful spirit of a PRS show, the creativity of the band, and showcases the enduring appeal of Vanessa Briscoe Hay as an extremely engaging front woman. The single is currently available for pre-order on Bandcamp.com.Chunklet Industries is distributed by Revolver USA and Midheaven Mailorder. For those of you who want to come celebrate at midnight with us, we have Michael Brunner providing a warm opening set, with Rachael Noon taking over at midnight. For those of you who want to toast at home and come a little later, we'll have peak time sets from The Bunker all stars Antenes and Mike Servito. If you're looking for some afterhours action, we have Patrick Russell closing the night with a set that should take us to the outer limits of our minds.